Animal Damage Repair is an extremely important and useful service. The hazards involved with animal infestations often include property damage. Animals can do extensive damage to your home, attic, garage, and yard. Buckeye Wildlife Solutions goes to great lengths to return your property to pre-pest condition. In most cases, damage repairs are most ethical to perform after the problem pest(s) is eradicated. Once we handle your animal issue, we will help restore your property its original condition. 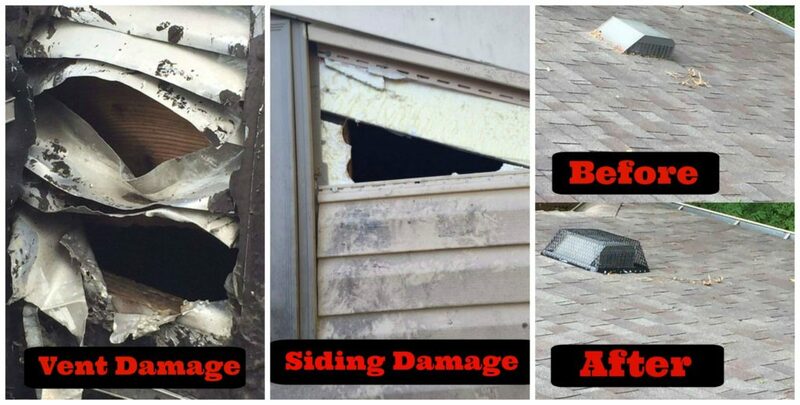 BWS experts specialize in reversing any and all critter damage. Getting rid of pests is only half of the job. Nobody wants to live in a house torn up by invaders. Our staff will identify anything in need of fixing. Upon discovering any damage, we will obtain digital evidence of the damage. This lets us present the damage to you in a way which is easily comprehended and allows us to keep accurate records. We make sure that you are 100% aware and informed about activity on your property. Once you’re aware of all damage to your property, our team will determine the best way to begin repairs. Every BWS specialist has a working knowledge of property repair and is suited to return your home or business to its former state. Furthermore, the methods we use help to keep your property free of pests permanently! Certain types of damage repair services, such as sealing or patching, may come with a warranty. Call (844) 544-9453 for more details! Exterior damage is caused by all kinds pesky animals. 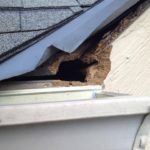 Raccoons may rip the siding right off your house; squirrels could be chewing holes through your roof; or groundhogs could have burrowed under your deck and caused foundational damage. 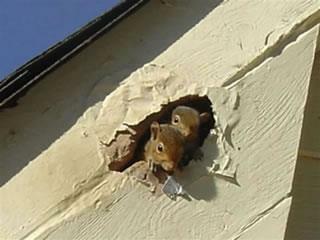 No matter your situation, Buckeye Wildlife Solutions is equipped to repair your property. Our services include sealing, patching, and fully replacing damaged material on the exterior of your home. 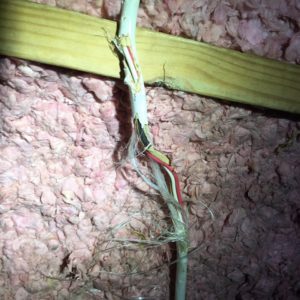 Attic repair makes for straightforward projects. Damage in your attic can be caused by many different species. 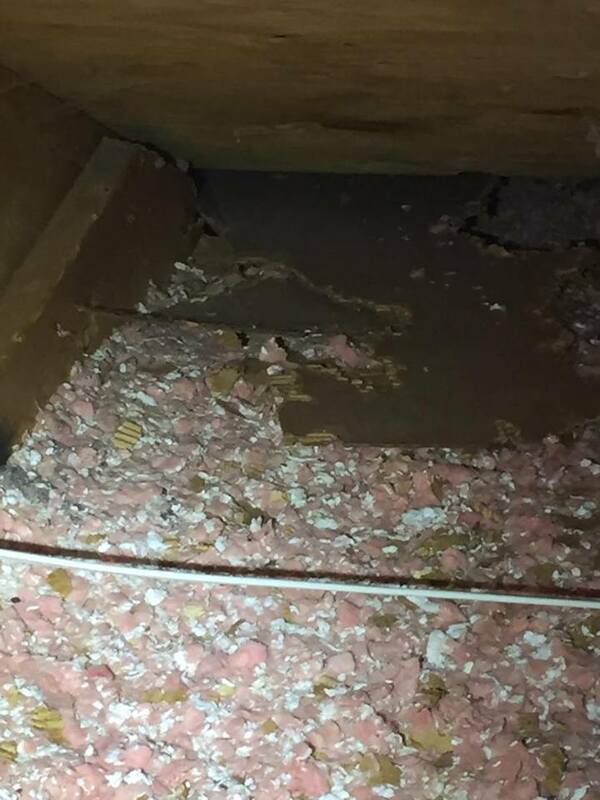 Often times, animals like raccoons, bats, birds, & rodents will burrow through your insulation. Once inside, they will scatter droppings all throughout the insulation and surrounding area. Animals can also damage property inside your attic like baffles, electrical cords, fans, & vents. Basic clean-up is the first step, although this job may require more work if extensive damage has been done to your attic’s infrastructure. Damage repair is usually necessary when dealing with invading raccoons. 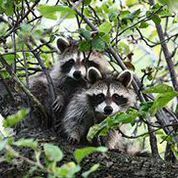 Raccoons are persistent and will cause problems in the realm of property damage. They should be removed promptly to avoid extreme damage. 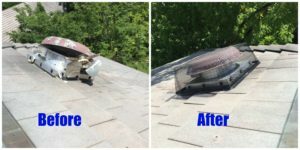 Raccoons can open holes around your roofline or vents, accumulating droppings inside your attic and ripping apart shingles and other attic material. Another very common service, squirrel damage repair is often required after an invasion. 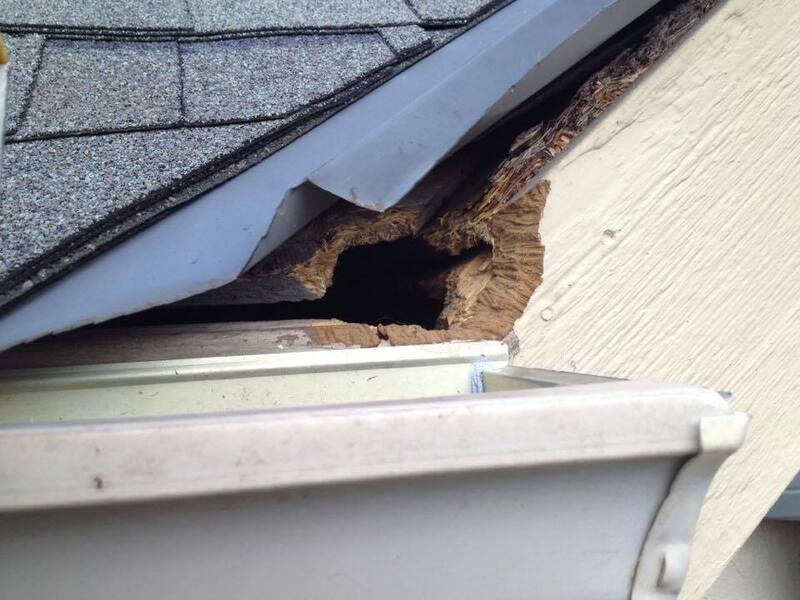 Squirrels damage is mainly a product of chewing holes around wooden roofing material. They do this in order to gain access to your attic where they hope to find food and shelter. Once inside, squirrels will chew through anything else they can find. This is extremely dangerous, as things like damaged electrical cords can be a fire hazard. Squirrels don’t look threatening, but they cause real damage and can put you at serious risk. 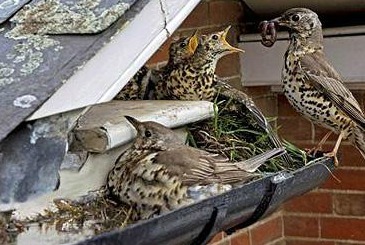 Birds tend to accumulate nesting material in attics & dryer vents. Some birds, like woodpeckers, are also capable of causing exterior damage to wood-sided homes. 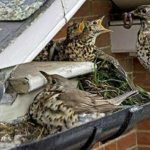 After removing bird colonies, we will repair any damage the birds have caused. 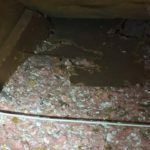 This typically involves attic remediation, and can range to extensive measures like installing new insulation or vents. Our staff is qualified to handle all pest animals throughout Ohio. Using advanced abatement strategies, we design plans to solve wildlife conflicts quickly and effectively. Our purpose is to protect your family and restore the state of your home to normal. Damage repair is vital to ensuring the health of your house and other property. By repairing existing damage, you not only heal your property, but also keep other pests out! 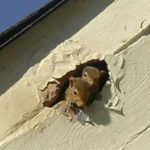 There are very few situations where pest animals do not cause any damage Animals will destroy attics – ripping or chewing holes through roofs and walls – as well as any exposed sections of your home. BWS experts are able to perform all necessary damage repair services. 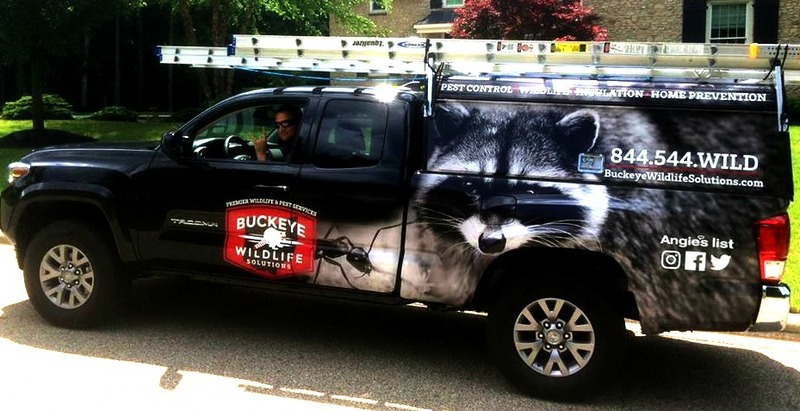 Buckeye Wildlife Solutions takes pride in making Columbus a safer place to live for all residents. Don’t hesitate to call if you have a pest problem. Dial (844) 544-9453 right now for more information!